JAFI board chair relates importance of having Israel, and reveals the underpinnings of BDS in questioning existence of Jewish state. 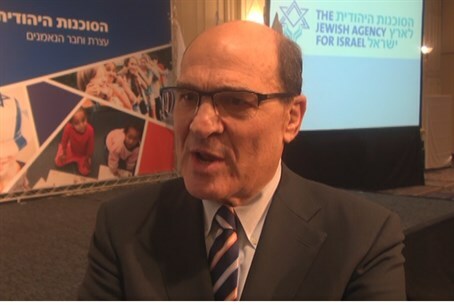 At the Jewish Agency for Israel (JAFI) conference in Tel Aviv on Monday, Arutz Sheva got the chance to speak with JAFI Board of Governors Chairperson Charles Horowitz Ratner about his organization's work for the Jewish people. Ratner noted that a major emphasis for the Jewish Agency is to aid the Jewish communities in France, Ukraine and western Europe where they are facing a rising threat of violent anti-Semitism. He argued there is no dichotomy between advocating aliyah, moving to Israel, at the same time that JAFI seeks to support Jewish communities where they are in the diaspora. The JAFI chairperson noted that JAFI Chairman Natan Sharansky recently returned to Donetsk in Ukraine, where a local non-Jewish leader told him everyone there wished they were a Jew, because the Jews have a place to go in Israel. Turning his attention to the BDS movement aiming to boycott the Jewish state, Ratner said their goal is not just delegitimization but also questioning the very existence of a Jewish state. He emphasized having "conviction in the righteousness... of your case. I thank G-d that we stand for something that is so correct... the right of the Jewish people to an independent state, a Jewish state, in the land of Israel."